Egg coffee is amber colored and you can clearly see some precipitate from the egg-coffe mixture. If serving the coffee warm it seems to be difficult to totally avoid the precipitate unless you filter the finished coffee through a cheese cloth or filter paper. The coffee in this picture has not been filtered yet. When looking into the chemistry behind this it isn’t as strange as it may sound. Fish skin as well as eggs contain proteins. The addition of proteins while preparing the coffee serves two purposes: 1) it helps the coffee grounds to flocculate, allowing them to sink faster to the bottom of the pot (this effect is probably more pronounced when using eggs) and 2) the proteins bind irreversibly to astringent and bitter tasting polyphenols in coffee to form insoluble complexes that will precipitate. 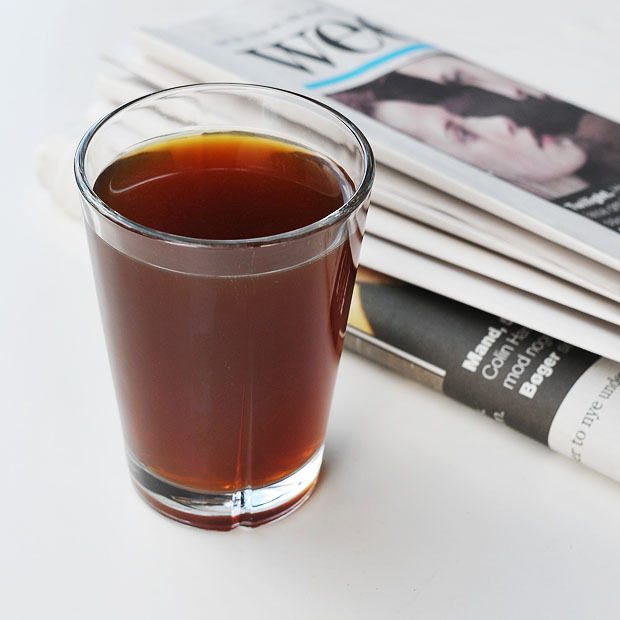 The end result is a clearer coffee with a pleasant and mild taste. The bitterness is only barely noticeable, but the coffee still has enough “body” so it doesn’t feel too thin! 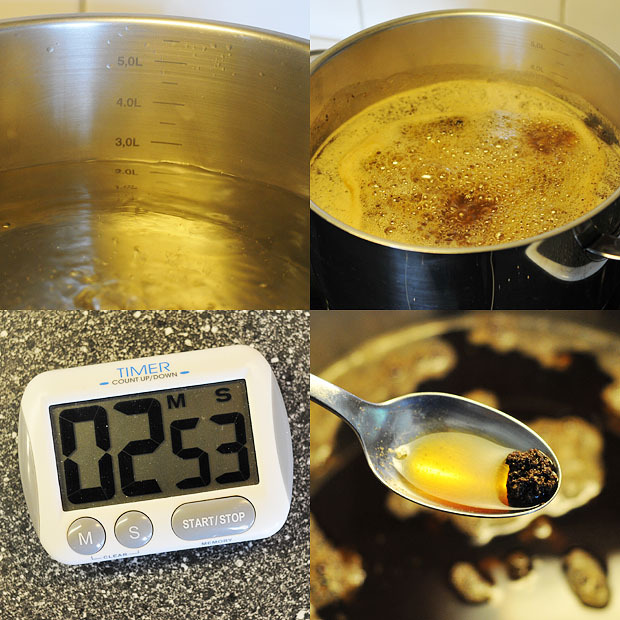 Mix coffee with an egg and 100 mL cold water to a thick paste. Add this mixture to the boiling water, stir carefully and leave to boil for 2-3 min. Remove pot from stove and add the remaining cold water. Let the grounds settle for a couple of minutes, skim off any floating particles, filter through a fine meshed sieve, a cheese cloth or filter paper and serve. The first time I made this I stirred quite a bit to break up the big lumps. But I was curious whether stirring had any influence on the amount of fine particles, so I repeated the whole process with as little stirring as possible. The lumps of ground coffee where significantly larger, but I couldn’t really see a difference on the prepared coffee. There was however a small difference when looking at the glasses from below (see picture below). My conclusion so far is that there is not a big difference, and that it’s OK to stir a little at the start to break up the biggest lumps. This will also allow a more complete extraction of the ground coffee. 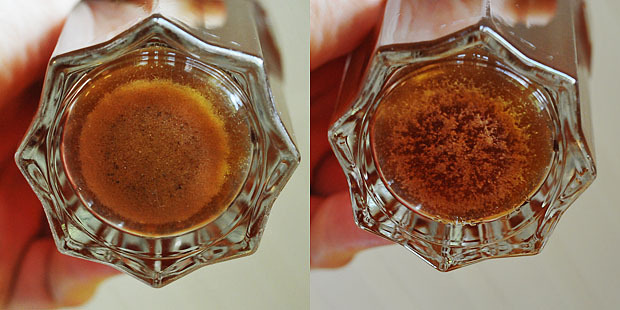 Difference between much (left) and little (right) stirring as the coffee boils as seen from the precipitate at the bottom of a glass of egg coffee. The addition of the cold water helps formation and settling of the precipitate. Home brewers talk about a “cold break” when they cool wort rapidly in order to precipitate proteins which have been extracted from the malt. And while we’re talking about beer chill haze also comes to my mind. This is the cloudiness that occurs upon cooling beer, and again it’s caused by precipitation of protein-polyphenol complexes. The effect of adding only 10% cold water to the still hot egg coffee is of course limited, and won’t really be enough to give a “cold break”. But since egg coffee has a pleasant taste even when cold, I have decided to cool a whole pot of egg coffee before filtering it. I may post more on how this turns out later, but initial tasting suggests that it’s going to be a very nice iced coffee! Take a sip of a dry red wine, preferably rich in tannin. Keep the wine in your mouth for 10-20 seconds without swallowing. Spit it into an empty glass and watch how a precipitate forms (this might take a minute or two). 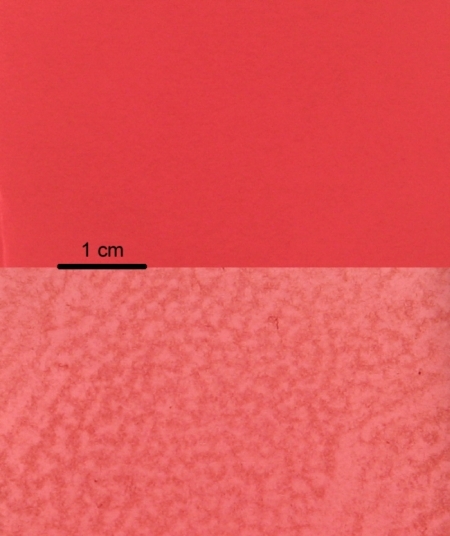 Notice how the color changes from red to light red or even pink (see picture below). Rinse your mouth by chewing a piece of bread and drink some water. Take a small sip of the wine that you just spat out (if you dare!). 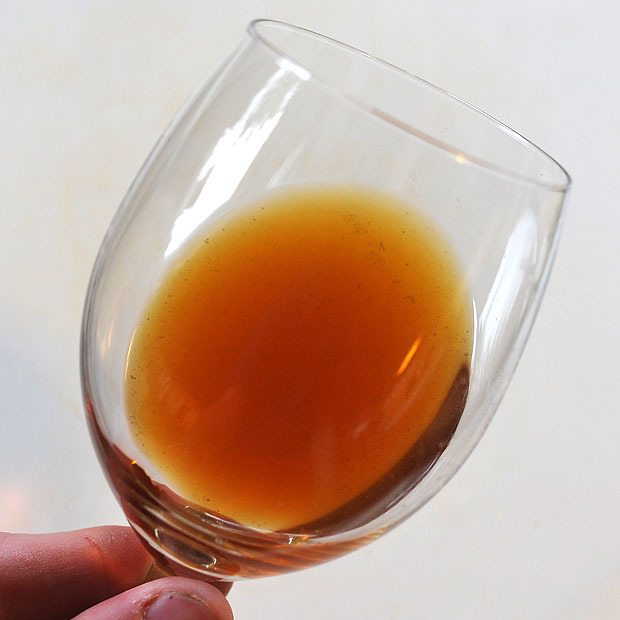 Since the tannins of this wine have already reacted with your saliva, it is as if they were removed from the wine, leaving a fad and flat wine without much taste at all. Top: red wine. Bottom: formation of precipitate in red wine mixed with saliva. The saliva flow rate and the concentration of proteins varies from person to person (the latter with a factor of 20). Furthermore the flow rate and protein concentration also varies throughout the day and is also influenced by what you are eating/drinking and even by the smell of food. As a consequence, a person with a high saliva flow rate and/or a high concentration of proteins is more likely to approve of a red wine rich in tannins than someone with a low saliva flow and a lower protein concentration. Knowing this, you should not be surprised that wine preferences can be very individual. Does it work with just egg whites? It seems to me this is the same process used to clarify consomme and sometimes to finish wine, and thus it should work as well or better with equal weight of whites. Maybe even a bit less yolk flavor. Our lab did some of the early work on salivary protein binding with tannins and the affect on astringency perception. We still have a 5 gallon bucket of dried pig saliva and a nephelometer stuffed in a corner somewhere. Horne, J, Hayes, J. & Lawless, H.T. (2002). Turbidity as a Measure of Salivary Protein Reactions with Astringent Substance. Chemical Senses, 27, 653-659. Astringency is something we know very little about. There’s two competing schools of thought as to whether it is physical or chemical in nature. Yes – first I thought about only using the egg whites, but then I decided to try a whole egg first. But on a weight-by-weight basis egg whites are of course more effective for reduction of bitterness. However, even when a whole egg is used, there is sufficient reduction of bitterness. And since the coffee does not have a disturbing yolk flavor I can’t really see any reason to only use egg whites (unless you have some left over egg whites in your fridge of course). Interesting paper by the way! And thanks for the info on astringency. 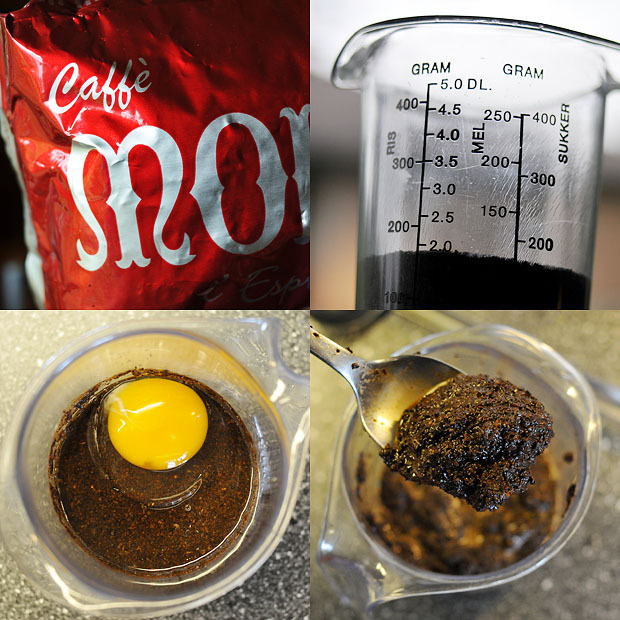 Being swedish, I was surprised, as I had never heard about using an egg in coffee grounds. The part about the fish skin made me think about a compound called isinglass. It’s isolated from fish bladder and is often used to clarify beer. It seems as if there might be some connection. Rob: That’s it – that’s the name – thank you very much!! I’ve actually read about isinglass before in relation to home brewing, but I never made the connection to the Norwegian “klareskinn”. I grew up in North Dakota, USA. My heritage is part Scandinavian, and my mother has told me that she remembers people putting egg in the coffee many times when she was a child. Many of the older folks swear by it. I’ve never heard of it but it does sound quite interesting, but I wonder if reducing the polyphenols has an effect on the (debatable) heath benefits of coffee? Still, any coffee is good to me! My family on my father’s side is Finnish, and he told me that his parents used the albumen of an egg (or just the egg shells, as mentioned above by Ghweiss) to make their coffee…I have an antique Finnish coffee pot, and it looks just like a copper tea kettle. The Finns would add the egg shells and grounds to boiling water, boil the mix, then take it off the heat for a few minutes. From what I understand, the grounds and shells would sink to the bottom of the pot and stay there, so that the pure coffee could be poured out the spout with no additional filtering. Scott M: does she only remember eggs, or also isinglass/fish skin? Ali: Including the egg shells is certainly more convenient. As long as it doesn’t have a deterimental effect I can see why a tradition has evolved to inlcude the egg shell as well. I’m enjoying the increase in coffee geekery lately! I’ll try this in the next few days and post results on the (back! Back! BACK!) Kamikaze Cookery blog. Any recommendation on bean for this? I’m guessing something that would normally be quite astringent, perhaps even with a higher robusta count than usual? Martin- You say that the egg binds too many of the compounds that influence taste in the coffee. I wonder how other clarifying agents used commonly in brewing and wine making would work? Gelatin, Irish moss, bentonite, polyclar, and silica gel are all possibilities. I imaging some of the non-protein ones, such as the bentonite and the silica gel, may remove a lot of the errant coffee grounds, while retaining much of the polyphenols. I would also be interested to know how the polyclar affects it. This agent uses static charge to clear the liquid. I imagine that this charge might help to select for certain polyphenols that you want and eliminate the ones you don’t. Do you have any ideas on this? I’m not very familiar with polyphenols, do they have any charge to them? Interesting that it would be known as Norwegian Egg Coffee: I’ve only ever seen a recipe for this type of coffee in Swedish and then present as something primarily done in Skí¥ne (the region at the southern tip of Sweden) – something I perceived as being in line with other egg-rich specialities from that same region (notably, eggekaka and kransekaka). So despite it being known around Scandinavia (although much less than I had anticipated), it seems that in the rest of the world it has become known as Norwegian egg coffee. One of the comments suggests that the technique was also employed in Hungary. This is also a traditional Hungarian method of coffee. My grandmother introduced it to me when I was younger and while I still prefer Turkish Coffee I use this method when alot of coffee is needed. The coffee/egg mixture keeps for about a week in the refrigerator so making it is as fast as boiling water. According to the video the technique leaves a mild nose of egg in the coffee–is this your experience. Interesting to see the scientific data. I used to make egg coffee on camping trips in Wisconsin. Always brought eggs along in the cooler but milk would be unsafe so would break an egg into the grounds and used my old aluminum coffee pot–over the fire or camp stove–that I used only on camping trips. Must have found references to it in WI cookbooks, because while my mother’s family was Swedish, I didn’t get the info from my mother. I don’t think I’ll try it in my coffee machine…. Again another interesting and inspirational post. Good job man!! Now that you have explained the “why” and “how” astringency is detected by the palate – I was thinking if we are able to use the insoluble protein-tannin complexes (without wine) to sort of create astringency “on purpose” for certain dishes where astringency plays important role. Or maybe an amuse bouche in which is so filled with this character then followed by a dish that we want to accentuate fattiness/creaminess. I saw an episode of In Search Of Perfection where Mr Blumenthal proved that astringency actually makes creamy dish tastes more creamy/fatty. This post is awesome. I like it so much. Thanks Martin. Eugene: That should be possible. Grape skin and grape seeds are high in tannins. You could maybe make an extract? If you google “grape skin phenolics” or ditto for seeds you get many hits. Another option would be to use pure tannic acid maybe (although careful dosing would probably be required). It’s funny, the first or second post I ever did as The Food Geek all those years ago was on coffee, and included what was known as “Cowboy Coffee,” which is essentially the same procedure. You did a far better job testing, analyzing, and explaining it than I did. Another excellent post. My grandma made this by saving the egg shells. The shells would have a small amount of whites inside. She would crush the eggs, and stir them into cold tap water with the grounds and put the pot onto the stove. Bringing it to a simmer slowly. Once the raft had formed and the pot was off the heat, she would wait ten minutes( i think it was ten) and drizzle cold water onto the top – the raft would start to sink and we would have coffee. This is known as cowboy coffee in western U.S. It was often made on cattle drives and on camping trips. The ground coffee is boilied in water in a large enameled coffee pot. Then, two eggs are broken and added to the hot coffee, shells and all. The coagulated egg settles the grounds and the shells neutralize some of the acid. The cowboys did not know the chemistry of the process, but it makes good coffee. David: Thanks for the info. It’s fascinating with all these examples of how salt and coffee have been made around the world! Cool! I didn’t know that this book was available in full text, but thanks for mentioning it! Thank you for the rundown on Norwegian Egg Coffee. I work at a winery in Napa Valley and just got to experience separating dozens of egg-whites to dump in a 9000 gallon tank to clarify some wine. That got me thinking about a video about making coffee and thought I’d give it a try. My Norwegian grandmas in Minnesota made this all the time. As for the comment about this being Swedish, yes, it’s Swedish as well. The eggekaka and kransekaka she referenced are not just Swedish, but Norwegian (eggekage and kransekake). Kransekake is a Norwegian wedding cake. I tried out Norwegian Egg Tea today. It worked well in removing both the stinging bitter taste and the tanning feeling in over-extracted black tea. By the way, I read and article in one of the latest Vinbladet, from Vinmonopolet, debunking some myths about tannic wines. It stated that wines with a high tannin content should be drunk with protein rich dishes such as meats and protein rich, stock based sauces. Tannin is however, not the best way to counterbalance fatty foods, as traditionally believed. This of course, makes perfect sense with the knowledge from this post. Thanks for a great blog. Will there be posts on Modernist Cuisine soon? hi guys, i am sri lankan, we also drink egg coffee. its very nice …………………. u all should try this ? In Finland, we make “Kahvi” which is similar, but perhaps a bit “barbaric” sounding. I include a traditional recipe below. Though you may fear trying it, I think you’ll find it makes a remarkably smooth and flavorful brew. As we drink coffee throughout the day and often into the evening as well, this is moderately large recipe. In a bowl, crush the egg (including the shell) into the coffee grounds and mix thoroughly! (Yes, it looks frightful!) When water is at a roiling boil, add the egg/coffee mixture and stir quickly. As it returns to a near boil, take it off the heat and let it “calm”. Stir and allow to ALMOST come to a boil again, then remove from the heat to calm. One more time for a total of 3 stirs and near boils. The coffee is never allowed to actively boil as this yields a less tasty batch. The egg, shells, and grounds will settle out in about 5 minutes. If you are picky, you can of course strain it, but it is unnecessary. I hope you might try this as well. I don’t know if the copper pot might have any effect on the food chemistry, but the copper is very traditional. I should note that I make mine a bit stronger than some Fins, but Finnish coffee is usually just a touch weaker than what most Americans like. Perhaps this is why we drink so much?